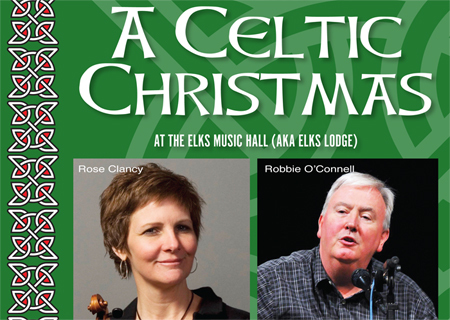 Spice up your holidays by joining us at Elks Music Hall for an evening of Irish music and song with Rose Clancy & Robbie O'Connell. Kevin Rice, Payomet Artistic Director, reflecting on Rose & Robbie's past Payomet show: "I smile just thinking and remembering the music, the humor, the singing and you have to know, those things happen mostly all at the same time with Rose and Robbie." Get ready for an explosion of Irish music and song, wit and humor on Saturday, December 8th when Payomet brings back the brilliant duo of Rose Clancy and Robbie O'Connell. Rose is one of the region's most beloved musicians, a master of fiddle, mandolin and banjo. And Robbie, originally from Waterford and Dublin, Ireland has been for the last three decades been hailed as one of the foremost songsters and funniest Irishman to grace a stage in the States. Opening the evening will be special guests the Celtic Roots (formerly Keltic Kids), a young Celtic band from Cape Cod, featuring Gavin Rice, Jonathan Ford, Bailey Ford, Lili Hay and Fern Tamagini-O'Donnell.